We have compiled a great list of brunch spots in Champaign-Urbana where you and your family can go to relax and enjoy a delicious Easter feast! We’ve also included a few places BEYOND Champaign-Urbana as well in case you’re up for a little road trip and want to try something new. Reservations are recommended at many locations; we recommend calling ahead. 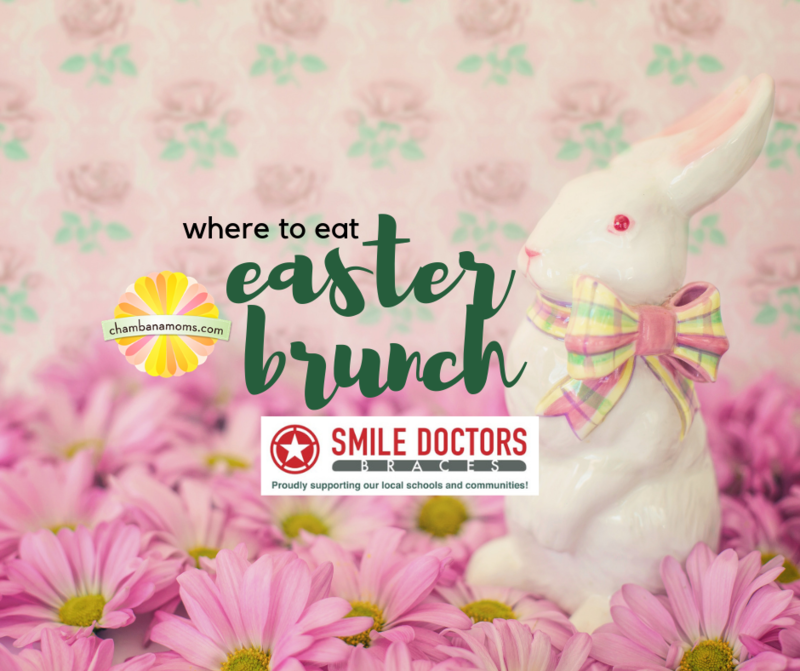 Thanks to Smile Doctors Braces of Champaign for sponsoring this guide of where to see the Easter Bunny in Champaign-Urbana. At Smile Doctors, you are more than just a patient, you’re family. Your experience should be fun and rewarding. In addition to creating your personalized, individual treatment plan, Smile Doctors Braces strives to get to know YOU. Smile Doctors supports you both in and out of the clinic. Smile Doctors Braces’ all-inclusive treatment plan includes all x-ray and pictures, scheduled appointments and comfort visits, follow-up care, and retainers with 2-year warranty. Smile Doctors offers comfortable, free consultations with x-rays to help you understand what your orthodontic needs may be. Smile Doctors Braces will MATCH your down payment up to $500. Call (217) 356-2222 or visit their website for more information. Silvercreek (402 N. Race St., Urbana) will be serving traditional Easter brunch items as well as some Easter favorites. The buffet-style brunch will be served from 9:30 a.m. to 4:30 p.m. Cost is $29.95 for adults; $15 for children 12 and under; children under 3 eat for free. Silvercreek does take reservations so call 328-3402 to reserve your spot. If you’re in the mood to order off the menu, a number of restaurants in the area will be offering a traditional brunch on Easter Sunday. Unless otherwise noted, all of these restaurants take reservations. O’Charley’s (730 W. Town Center Blvd., Champaign) 10 a.m.-2 p.m. No reservations. The Courier Cafe (111 N. Race St., Urbana) Breakfast served until 11:45 a.m. No reservations. Le Peep (2209 S. Neil St., Champaign) 7 a.m. – 2 p.m. No reservations. Did we miss your favorite brunch spot? Share it with us!